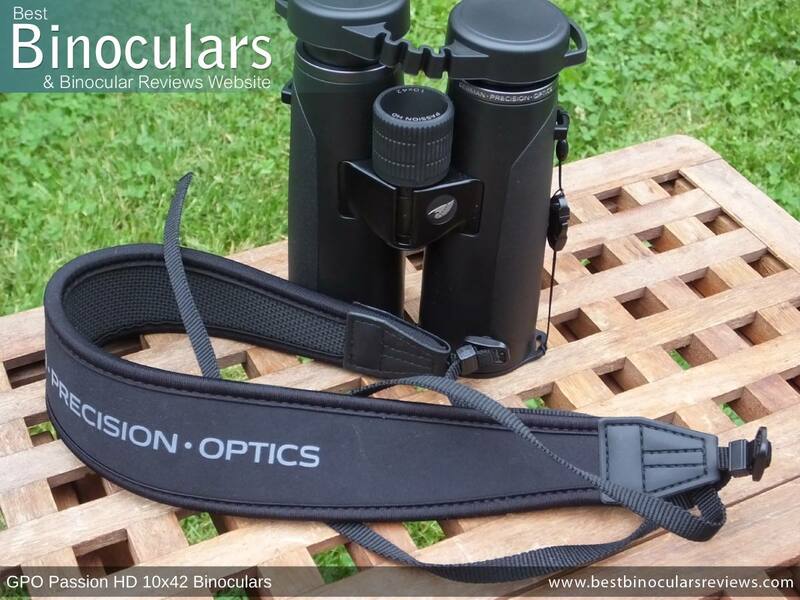 A relative new player in the premium optics market, German Precision Optics (GPO) has really hit the ground running with their flagship Passion HD Series which are designed in Germany, manufactured in Japan and then 100% quality controlled back at their headquarters in Germany. 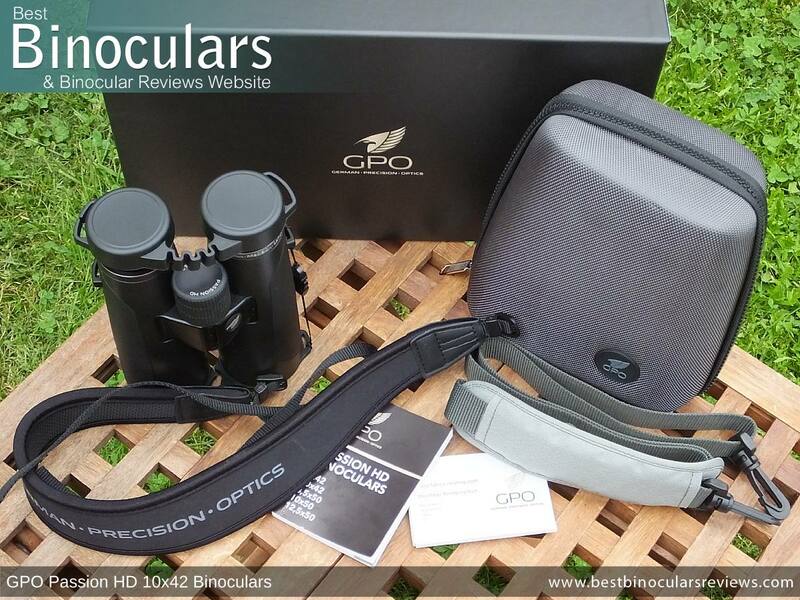 I say 'hit the ground running' because from my initial research into them, the GPO Passion HD binoculars seem to have all the expertise, important features and components that you expect to find on just about any of the 'alpha' level binoculars from the more established premium European brands. Thus if you consider their lower price tag, they certainly do seem to offer both a viable and indeed good value alternative should you be in the market for a premium level instrument. All the instruments within this series feature a modern looking single, top-hinge design. The hinge itself is very thin, indeed GPO themselves describe it as being a "micro-bridge". At just over 3cm wide, the advantage of this thinner bridge is the potential weight saving and the fact that it frees up much more of the barrels to grasp hold of due to the less material used. 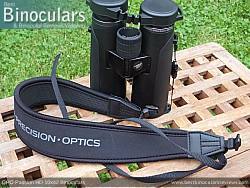 This is something that I really like as I will often use my binoculars without a neck strap and thus having a large and secure area to hold onto is important. The potential drawback to this design is that it is structurally less strong than a thicker bridge and thus there is more chance of the barrels becoming misaligned. However, the bridge on these 10x42 GPO Passion HD Binoculars really does feel robust and whilst I obviously could not test it to destruction, I would add that it looks and feels like it would take a large force for this to happen and I really would not have any concerns in this area. The hinge opens and closes smoothly and has enough resistance to ensure they remain at your desired setting to match the distance between your eyes.. The IPD (Inter-Pupillary Distance) range on these GPO binoculars is from a minimum of 5.7cm up to a maximum of 7.5cm which for a 42mm roof prism binocular is pretty standard. As with most modern binos, much of the exterior is covered by a rubber jacket. On these GPO binoculars this envelopes both the barrels, with only a few small details and the bridge left exposed. The rubber that they use is extremely hard, so much so that it can at first glance look to be a plastic or even metallic exterior. This finish does look very good and I have to include that the fit to the chassis underneath is excellent. Softer rubbers can often move or slide about on the chassis if not glued on correctly, but there is absolutely no chance of that occurring here. The downsides to this hard, thin rubber coating is that it provides less cushioning from blows than thicker, softer ones and there is certainly less grip. GPO has countered this somewhat by adding a fine texture on the sides of the barrels which does help, but even so, you would never describe these bins as having a high grip exterior. German Precision Optics have used a magnesium alloy for the main chassis and the hinge, which is what you would expect to find on an instrument of this class. Whilst not as lightweight as polycarbonate plastic, it is unquestionably stronger and I am lead to believe that magnesium has a very good resistance to temperature related expansion and contraction. This can be important as any movement can lead to the optics being pulled out of alignment if you ever expose your optics to extreme temperatures, be that due to the environment or perhaps if you were to leave them in a hot car by accident for example. 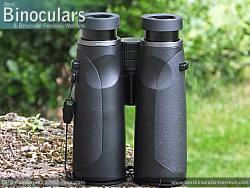 These GPO Passion 10x42 HD binoculars are advertised as being both waterproof and fogproof. Whilst I did not test this, in their specifications, they claim that this bin will remain watertight to a pressure of 500 Mbars, which should easily be enough to cover most normal uses in wet weather conditions. Fogproofing is facilitated by the use of Nitrogen gas which is pumped into the chassis at the factory. It is completely moistureless and thus does not collect or fog the internal lens surfaces as an unprotected instrument would probably do when you have a rapid temperature change (like taking them out of a warm house in winter). The eye-cup housing on these GPO Passion binoculars is made aluminum and not plastic as which is often the case on cheaper instruments. The padded section is attached very firmly and even though it is made from a thin rubber, is no less comfortable than what I would consider to be normal. The twist-up mechanism is truly excellent on these. With no free play or looseness, there really is a noticeable feel of quality to the whole system and I especially love the way they very positively click into each of the three stops. At 17mm the level of eye-relief is very good and should ensure that you get the full view, even whilst wearing glasses. Large (30mm diameter & 30mm long), it is well positioned which made it very easy for me to reach from the standard grip and position when you hold a bin up to your eyes. My wife, who has much small hands than I do gave it a try and also had no problems whatsoever. In terms of gearing, it takes 1½ turns (540°) to move the focus from one extreme to the other, which I would describe as being fairly moderate. So a nice middle ground between the speed at which you can make large changes and how easy it is to make small accurate adjustments. Added to this, the movement of the wheel is very smooth and with just enough friction to prevent unwanted turning, it makes fine tuning your focus, even with one finger about as good and easy as it gets. It's prominent position and high grip rubberized track also make it very easy to accurately adjust even whilst wearing gloves. The only slight negative comment I have is the rear face plate on the focus wheel is rather bland and made from plastic. I personally prefer those that are made from metal and have the brand or a design etched into it. But this is only my taste and in no way affects its function. 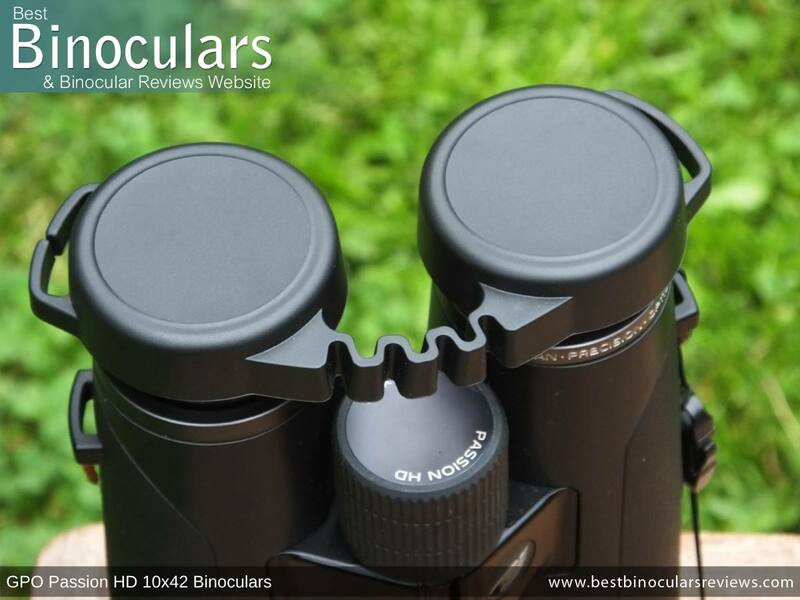 As with some other top end instruments (like the Swarovski SLC 10x42 binoculars), the diopter adjuster on these GPO binoculars is integrated within the focus wheel. This is a system that I really like and prefer to the more common right-eye diopters for calibrating your instrument. Firstly it is out of the way as well as lockable and thus makes it very unlikely that your setting will be altered unintentionally. When you unlock the diopter, by pulling back on the focus wheel, it reveals a marked scale, which is something that many standard right-eye diopters omit. 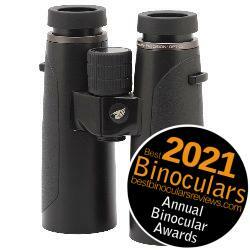 This makes it much easier to return it to the desired setting should you change it and can make swapping your binoculars between two users who have different settings much less of a pain. 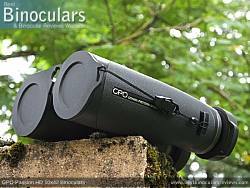 The GPO 10x42 Passion HD binocular is 'tripod adaptable'. What this means is that they can very easily be attached to a tripod using an ordinary tripod adapter that screws into the front face of the hinge after you have unscrewed and removed the dust cover. In terms of their weight, for a 42mm binocular and as demonstrated in the table below, these GPO Passion 10x42 binoculars are on the heavier end of the spectrum. However when looking at weights of binoculars I feel that it is important to take into consideration that these and many other top of the range instruments feature a magnesium chassis and aluminium eye-piece housings, whilst many cheaper lightweight instruments will have polycarbonate and other plastic parts. Their official outer dimensions are fairly typical for a 42mm binocular and so not too much to report here. As with just about every manufacturer, German Precision Optics do not supply any information regarding the makeup and arrangement of the lenses in their eyepieces, so I can't really comment. What I can say is that the outer ocular lens has a diameter of 24mm in diameter, which I have to say, ranks up there with the largest that I have measured on a 42mm binocular. Large ocular lenses potentially offer a number of advantages, which includes making it more easy to line your eyes up to them correctly (so less black rings forming on the edges of the view) and improved image resolution. 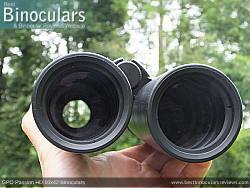 For more on this, take a look at my article on Binocular ocular lens size. The 42mm objective lenses are set back about 9mm from the ends of the barrels, which in my experience is fairly deep. This provides them with a good level of protection, from both physical damage and environmental conditions like light rain. As well as this, it helps prevent dust from settling onto the glass and acts a little like the lens hood that professional photographers use to minimize the lens flair effect. The "HD" label can mean many things in the world of optics as many brands use it in their marketing to describe different things. 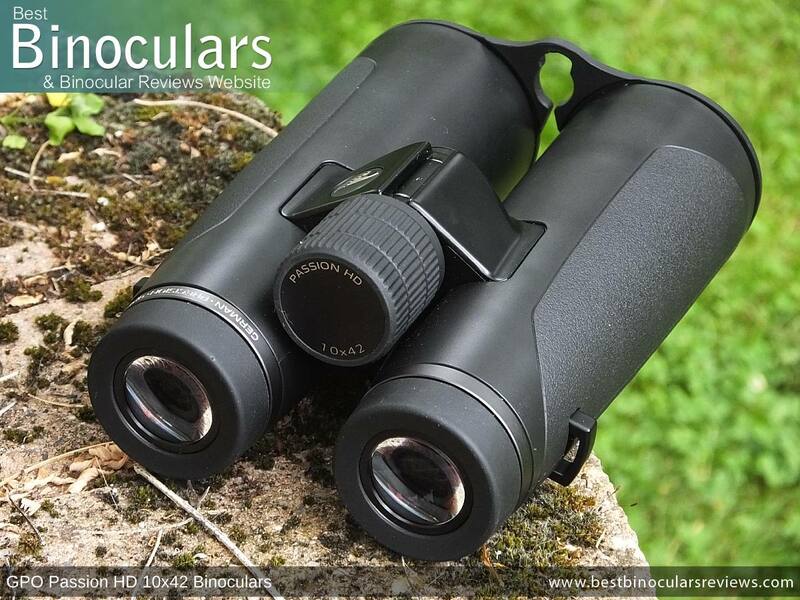 In this case, the GPO Passion HD binoculars have two ED lens elements (two fluorite containing lenses which are "cemented" together) within each lens. Many brands now offer lenses with at least one element that is made from ED (extra-low dispersion ) glass, but I am not sure just how many have two or more? Essentially ED glass elements give the lens designer more options when it comes to controlling the wavelengths of light as they split up going through the lens and thus reduce chromatic aberrations for a sharper, Higher Definition view with less color fringing.. However it is also important to note that not all ED glass is equal and that just adding ED glass, does not magically make the view better. 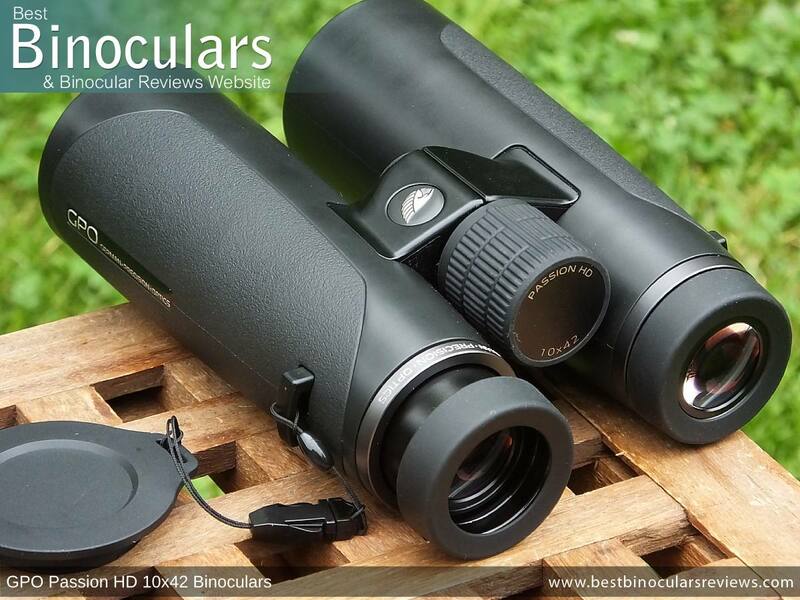 You still need the considerable expertise to go with it and to take the whole optical pathway into account when designing and placing the lenses within a binocular. So how do these perform in this area? Take a look at my section below on the Image Quality. The whole series of GPO Passion HD binoculars use Schmidt Pechan design of roof prisms in order to rectify the inverted image, which has the advantage in that they enable a more lightweight, compact instrument to be made. As you would expect from a top of the range, alpha level bino, the GPO Passion 10x42 HD is Fully Multi-Coated. The exact wording here is important as it confirms that there are multi-coatings of an anti-reflection material added on all air-to-glass surfaces throughout the entire optical system. Lesser quality products are only Fully Coated or Multi-Coated, and this makes a big difference to both the quality and brightness of the view. . It is also good to confirm that the prisms have multi dielectric mirror coatings added to them, this ensures that more than 99% of the light gets transmitted. Lesser quality roof prism binoculars will use silver or aluminum, which are both better than nothing at all, but certainly not in the same league as a dielectrically coated roof prism. As well as this,German Precision Optics have also ensured that phase correction coatings have been added to the prisms on the Passion HD series and thus eliminates the problem of the individual wavelengths stepping out of phase with each other as they pass through the prism. The result is once again an improved image resolution and contrast. As well as their deep setting from within the ends of the barrels, the outer lens surfaces are further protected in that they have been treated with a hydrophobic material. GPO call this their "PASSIONdrop hydrophobic coatings" and they work by filling in the micro-grooves and channels created when the lenses are finely polished. In this way they make a smoother surface and so if any water, oil (often from fingers) or dirt does get onto them, it has less to adhere to and thus simply rolls or falls away. This helps maintain a better view in all conditions when out in the field, they stay cleaner for longer and are easier to clean when you eventually have to. This means you apply less force whilst cleaning, which in turn reduces the likelihood of you marking or scratching the lens. This GPO Passion HD 10x42 binocular has a FOV that is 336ft wide/high at a distance of 1000 yards away (112m @ 1000m), which for as you can see from the comparison table below is excellent for a full-sized 10x binocular and places them right up there amongst the very best. This comparatively wide view will most certainly be a benefit to birders, hunters and general wildlife observers who often explore wide open areas and observe subjects at longer distances (like at the coast, in the fields or hills example). From experience, I regard any full sized binocular with a magnification of between 8x and 10x, that has a minimum close focus of 6ft or less as being excellent. 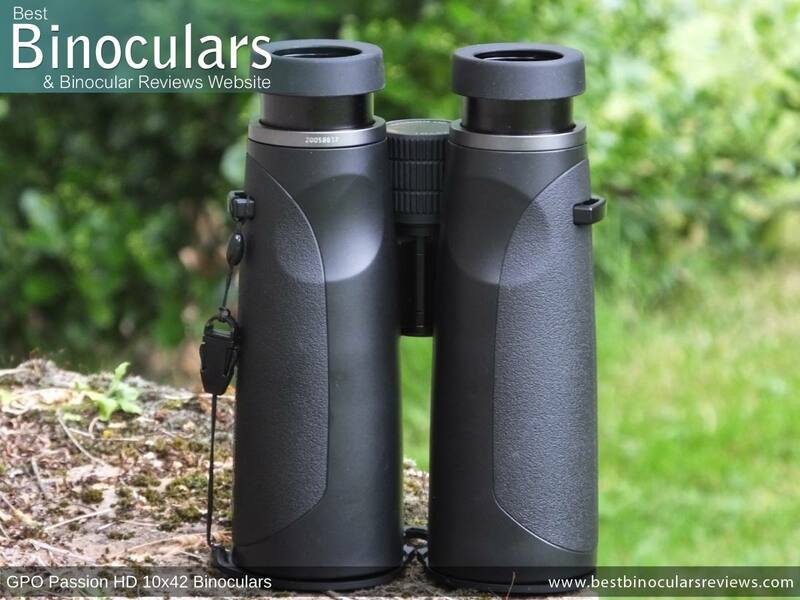 Thus with an official close measurement of 6.5ft (2 meters), these GPO binoculars are extremely good and certainly makes these a good option should you also like to occasionally direct your view towards a butterfly, flower or indeed bird on a nearby bush or feeder. The fact that these have a wide field of view and good minimum focus, means that I am doubly impressed by the fact that these GPO Passion HD binoculars are still able to deliver a full 17mm of eye-relief. 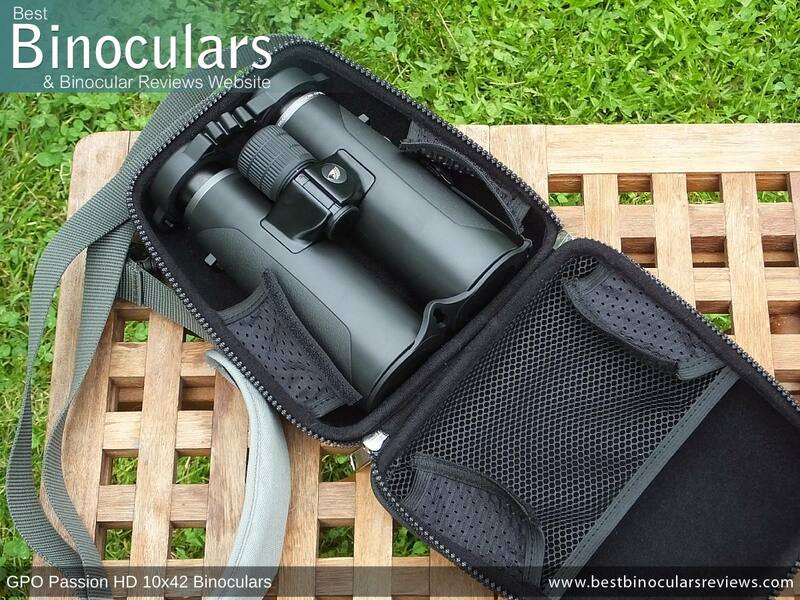 Whilst this fall just 1mm short of making it onto my list of Binoculars with Long Eye-Relief, for a 10x binocular it is impressive and should be enough for most eyeglass wearers to maintain the full view without black rigs forming on the edges. Describing the view I see through a binocular is by far the hardest part of writing these reviews, yet in many ways it is the most important. The problems are that it is very subjective, over time one's perception can change and spotting differences between instruments (especially high-end ones like these GPO Passion HD's) is very difficult. In both good light and very low light conditions just after sunset, I really could not discern any difference in image brightness between these GPO Passion HD 10x42 binoculars and that of my alpha 10x42's. Both instruments produced an image that I thought was slightly brighter than the mid-level benchmark in good light, which only became more noticeable as the ambient light worsened. Thus in terms of image brightness, this leads me to rate these GPO's right at the top of what you can expect to get from a 10x42 binocular. Comparing them once again in a wide range of scenarios and light conditions, once again the colors and level of contrast in the image looked to me to be pretty much identical to my alpha benchmark 10x42. There is no obvious unnatural tinting of the view and the colors look vibrant, but not so much so as to make the view look artificial. The same can be said of the contrast, which shows a good variation between dark and light areas, but is not too harsh. So here once again I rate the view through these GPO's very highly. 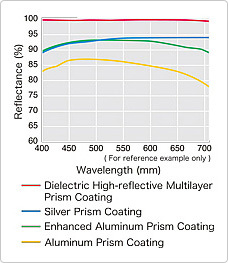 As I mentioned in the optical components section above, the use of two ED elements in each lens intrigued me and so I was very interested to see if this translated to there being less observable color fringing in the image as this is largely caused by chromatic aberrations, which ED glass can help reduce. Well I have to say that once again, these GPO Passion HD binoculars really excelled. Even whilst viewing objects like a black telephone line against a bright sunlit sky, the level of observable color fringing is as little as I have ever seen. Indeed in this area, they are not only a match, but I place them above that of my alpha benchmark. Something that I have never done before! The level of fuzziness right at the edges of the view is very minimal (almost non existent) and once again, in my experience is about as good as you could ever hope for. In terms of other image distortions (like unwanted image curvature) at no time did I notice anything out of order. 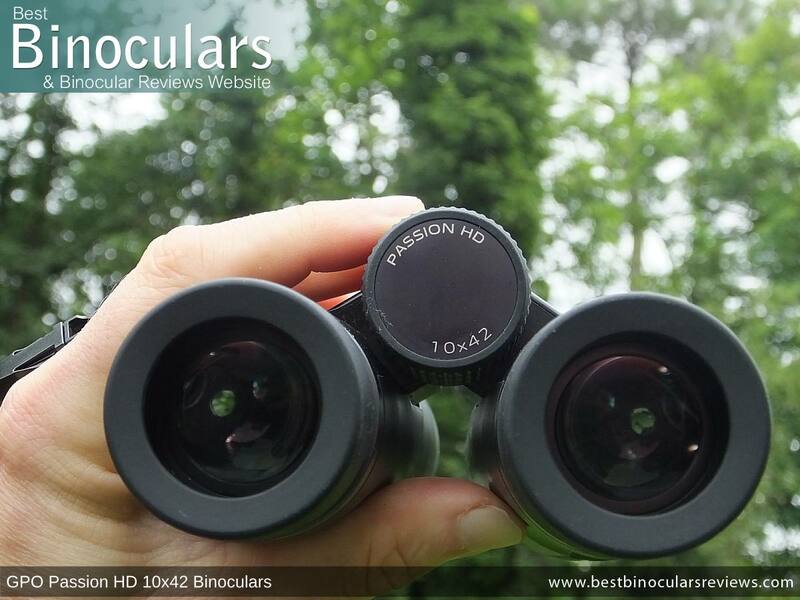 In my experience, the view through these GPO Passion HD binoculars is as good as any 10x42 binocular that I have had the pleasure of looking through and feel that they are fully deserving of their score of 10/10 for a binocular in this class. 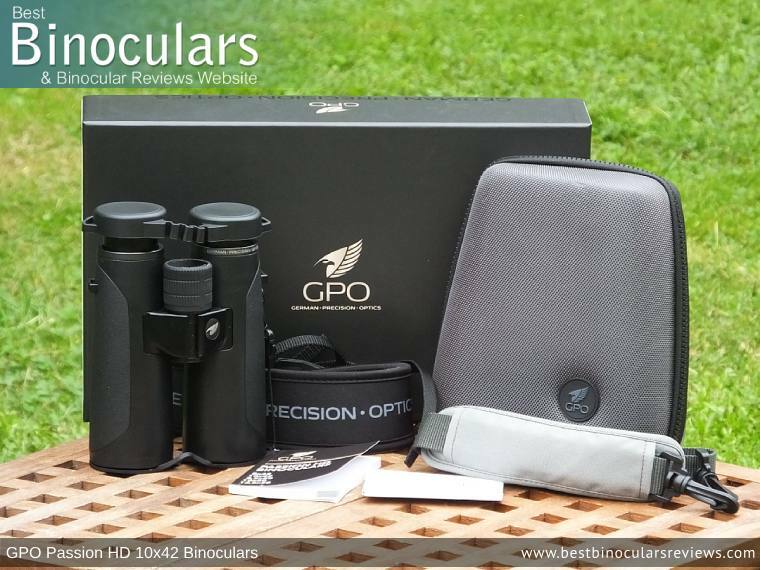 When you take a look into the stunning looking packaging you will also find a predictable, but very good quality arrangement of accessories for these GPO Passion 10x42 HD Binoculars. This consists of a protective carry case, neck strap, objective lens covers, rain guard, cleaning cloth and instruction booklet. The carry case that these GPO binoculars are supplied with is generally excellent. The design looks great and I like the GPO logo on the front and instead of the customary soft case, this one is more solid in it's construction which provides far more protection to the instrument contained within. You gain access to the interior via a heavy duty Zip that goes around three sides of the case. This makes for a very secure means of closure, however, you do need to be careful when using it if you need to remain silent, like when hunting or even some birding situations. Inside the case is lines with a soft felt like material and there is a separate netted compartment for storing things like a cleaning cloth. 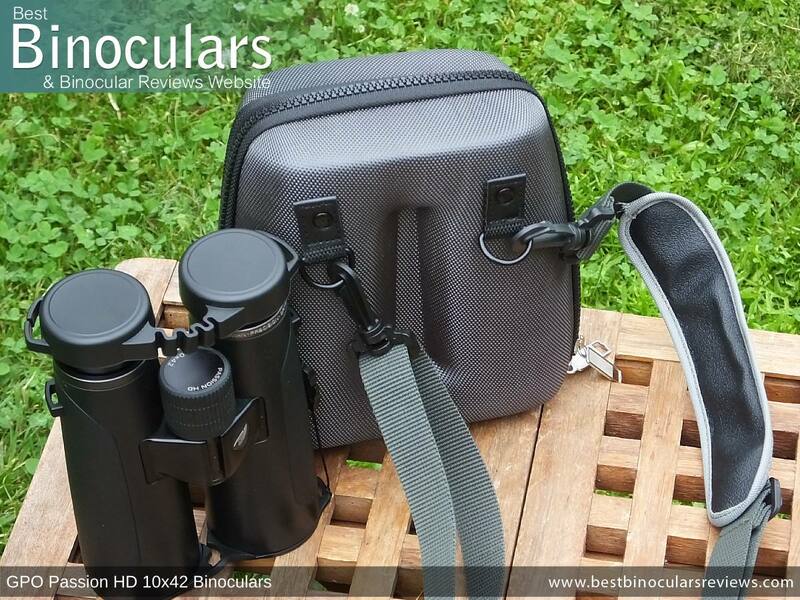 These 42mm GPO Passion HD binoculars fit perfectly inside and they can be stored with the eye-cups fully extended and with the neck-strap attached and thus ready to use as soon as you take them out. The case also has its own excellent quality carry strap that includes a padded shoulder section. It attaches to the rear of the case via a couple of pivoted quick release clips. In terms of comfort and build quality, the neck strap is excellent and you really could not ask for more. Made from what looks like a Neoprene type of rubber, the padded section is very wide (5.8cm) as well as thick (8mm) and thus not only spreads out the load, but also offers plenty of padding. The underside is left uncovered and thus provides plenty of grip, which helps prevent the strap from sliding about on your neck and shoulders. Attaching the strap to the binoculars is achieved in the usual way using a slider and threading it through the eyelets on the instrument. This tried and tested method works well enough and means you can easily adjust the strap for length. I just wish they had used some sort of quick-release clip to make this task quicker and easier for those who often like to alternate between a neck strap and binocular harness. Made from a soft rubber/plastic, both the objective lens cover and the eye-piece cover (rain-guard) are basic, but functional. The objective lens cover is a little different from the norm in that rather than two separate cups, you get a single piece that fits into the ends of the barrels. It also has a somewhat unique way that you can tether it to the binocular with it's own quick-release cord. This is something that I have not seen before, but I really like. Coming in it's own protective packaging, the included micro-fiber cleaning cloth is of excellent quality and as good as any that I have seen, which is great and ideal for use in the field..
As always, for more complete and safe cleaning of the lenses, I suggest you use a dedicated lens cleaning kit. The included booklet is relatively comprehensive, written in eight languages, it covers everything from attaching the neck strap to calibrating the binocular to your vision using the diopter. From the table below, you can compare some of the details of these GPO binoculars against a small selection of other High End (Price between $500-$1200 / £500-£1200) 10x42 binoculars in the BBR database. Open table in full-screen mode to view the full results. The use of extremely high-quality components, optical glass and coatings, combined with an obviously high level of expertise in both Germany and Japan has all come together to produce what I believe is just about an alpha level binocular, but at a sub alpha price level, which is seriously impressive. 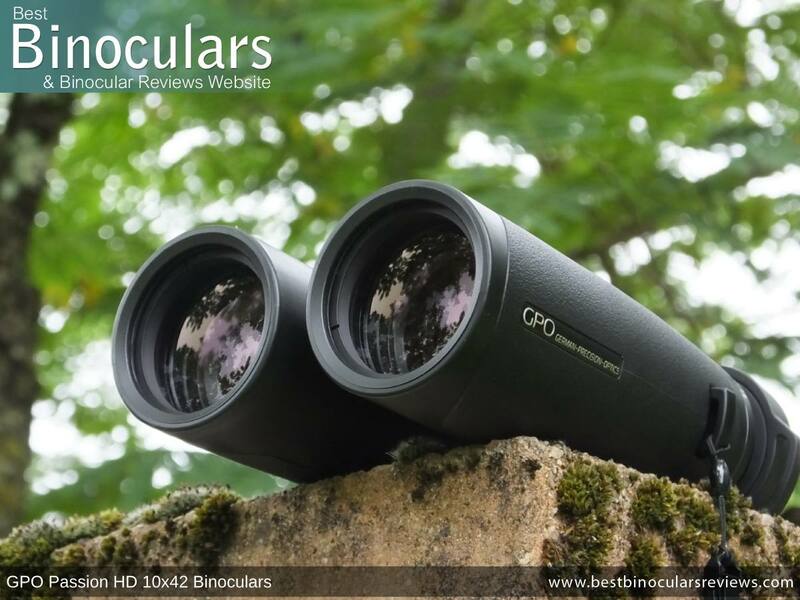 These GPO Passion HD 10x42 binoculars are truly excellent and certainly up there with the very best in this and even the higher price ranges. Sure at this moment and because they are relative newcomers, there will be some users that will dismiss them. But this is mostly down to their lack of heritage and not because they lack in a particular area on the product itself. My bet is, if German Precision Optics maintain this standard, in time, their heritage will be every bit as impressive as the other European brands that we have come to revere. 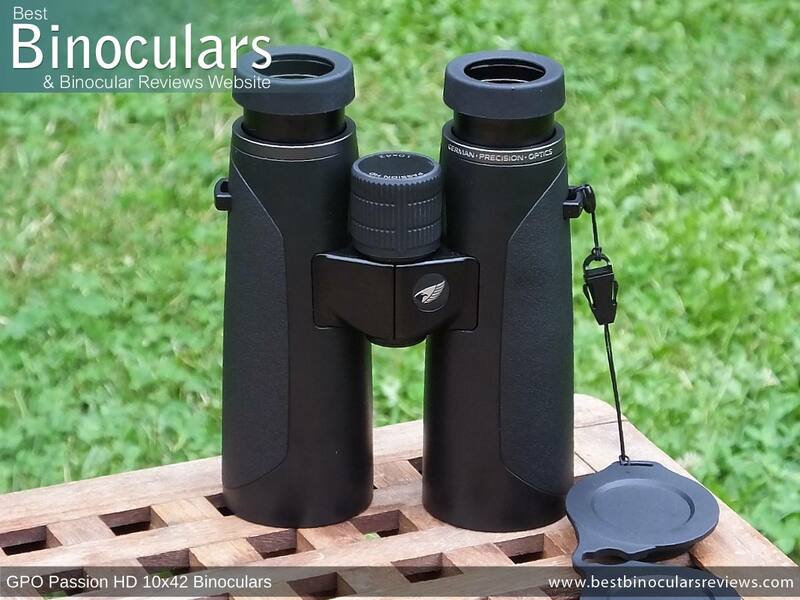 For a 10x42 binocular, the image quality and brightness is sensational and as good or better than any I have ever had the pleasure of looking through. Components Used & Build Quality are out of the top drawer. 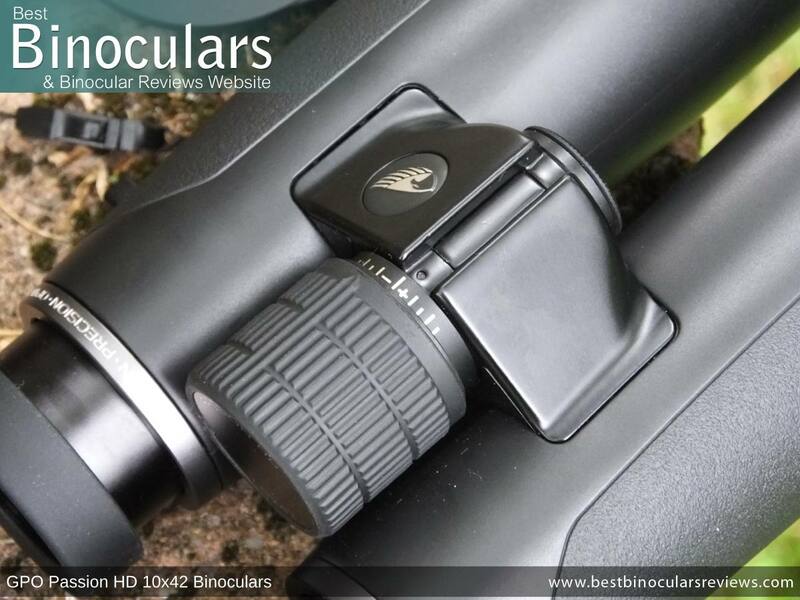 From the magnesium chassis and aluminum eye-piece housings to the integrated diopter and focus wheel and not forgetting the high-grade optical components and coatings, the high level of components and the noticeable build quality is evident throughout the whole instrument. German Precision Optics highlight that they use more than one ED glass element in each of their lenses. This is an interesting feature as I assume it is potentially able reduce chromatic aberrations even more than bins with single ED lens elements. Whatever the case, the image quality and lack of color fringing speaks for itself. At 17mm, the GPO Passion 10x42 HD binocular has ample eye-relief, making these an ideal choice should you want or need to wear glasses whilst binning. For a 10x powered instrument, these GPO Passion HD 10x42 binoculars have a wide field of view. Indeed at 336ft@1000yds, it exactly matches that of both the Leica 10x42 Ultravid HD and the Swarovski 10x42 EL. Although with a FOV of 330ft@1000yds, all three fall a fraction short of the Zeiss 10x42 Victory FL. 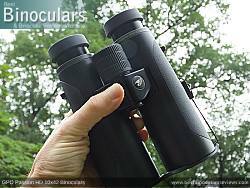 The minimum close focus distance at 6.6ft is also very good for a 10x binocular, although it does fall a little short of the very best. Take the Swarovski 10x42 EL that has a close focus of only 4.9ft. At 29.6oz (840g), these are a little heavier than many 42mm binoculars. However, this extra weight must be balanced against the fact that they have many aluminum and magnesium parts, which are certainly more desirable than the more lightweight plastic alternatives used on many cheaper products. The neckstrap itself is excellent, but I think that it could be even better if German Precision Optics were to add some quick release clips to it. In this way you can quickly remove it should you wish and this would also allow a quick transition between carrying it around the neck and on a harness. 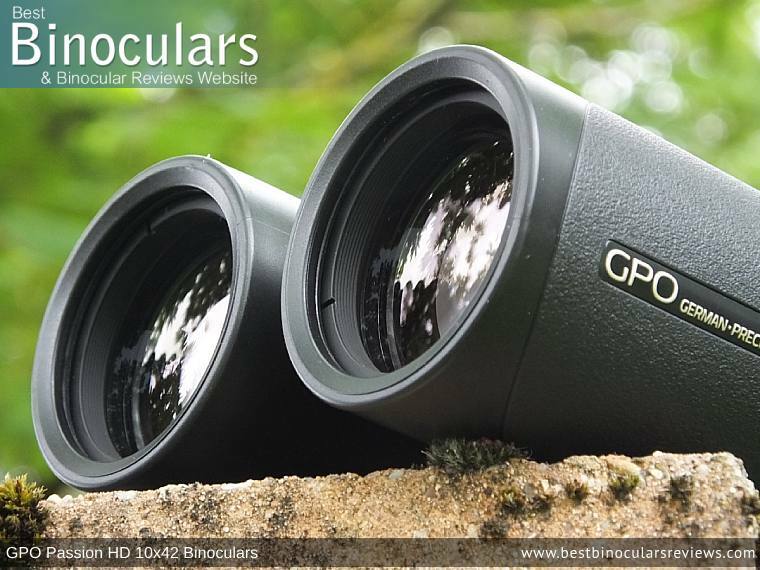 In terms of its function and performance, the focus wheel on this GPO Passion HD 10x42 binocular is once again excellent. However, I just feel that replacing the plastic face plate with a metal one would enhance the overall appearance and make for a better match to the quality of the optics and other components that they use.